December 22, 2016  Many meat producers say they are reducing their use of antibiotics. Yet the latest government statistics show that sales of these drugs for farm use continue to grow. September 8, 2016  We know that bacteria can become resistant to antibiotics, but we've never seen it happen. An MIT scientist figured out how to show bacteria surviving antibiotics and invading a giant petri dish. 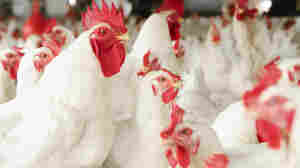 December 11, 2015  Producers of poultry, cattle and pigs continue to use more antibiotics, according to the latest government data. 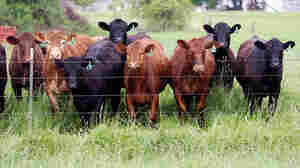 That's despite more pledges from food companies to sell meat raised without the drugs. November 3, 2015  Some Chipotle restaurants now sell pork from pigs that received antibiotics to treat illness. 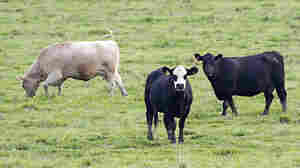 It's a move that acknowledges the drugs can be used responsibly on farms. May 20, 2015  The Food and Drug Administration wants to know which farm animals are getting treated most heavily. But the FDA's proposal still falls short of the best European data practices. March 20, 2015  For the first time, scientists have estimated the amount of antibiotics pigs, chickens and cows consume globally — and how fast consumption is growing. Which country uses the most drugs on farms? March 8, 2015  Random tests of milk reveal that a few farmers are treating dairy cows with antibiotics that aren't supposed to be used on them. The FDA is now considering tighter controls to prevent such practices. September 22, 2014  What does it take to get chickens off antibiotics? According to Perdue Farms, an added dose of the "good bacteria" known as probiotics can help crowd out the harmful microbes that make a chicken sick. February 19, 2014  Chick-fil-A's plan to ditch antibiotics in its birds is part of a small but growing trend. 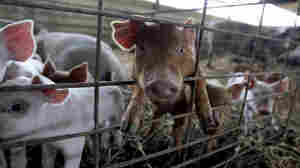 Driving the growth is concern about the risks associated with routine use of antibiotics in farm animals. January 28, 2014  Documents show that Food and Drug Administration scientists allowed 18 drugs to be sold to farmers despite a risk to human health. 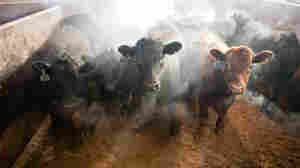 Antibiotic Use On The Farm: Are We Flying Blind? August 29, 2013  No one knows exactly how farmers use antibiotics. 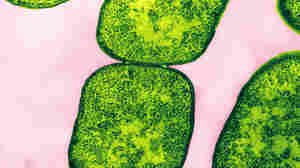 Many public health experts say the government should collect and publish detailed information because antibiotic-resistant bacteria are an increasingly urgent problem. But many farm groups are opposed. 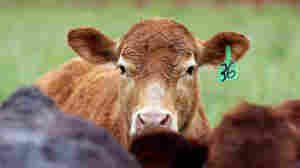 Are Antibiotics On The Farm Risky Business? 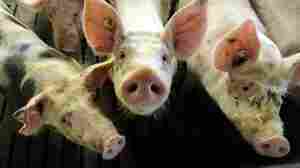 July 11, 2013  Farmers give antibiotics routinely to pigs, beef cattle and poultry. They say the drugs help keep animals healthy and get them to market faster. Others say this practice practically guarantees that bacteria will develop resistance to these antibiotics more quickly, endangering human lives and the long-term viability of the drugs. April 10, 2013  Both fruits are vulnerable to a nasty disease called fire blight that can devastate orchards. 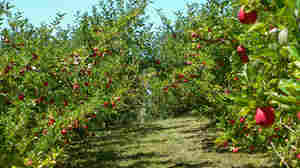 So organic labeling standards allow for antibiotics to be used on apple and pear trees. That exemption is set to end in 2014 — but growers say they need a little more time. February 11, 2013  Manure from pig farms doesn't just contain residues of antibiotics used in livestock. 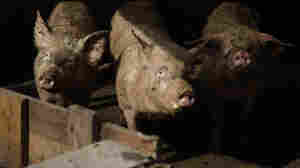 It also carries high concentrations of antibiotic-resistant bacteria, a new study of Chinese pig farms finds. And researchers say "it's a global problem." October 2, 2012  Consumer group puts pressure on hip grocery retailer Trader Joe's to sell only antibiotic-free meat. The group says if Trader Joe's makes this transition, it could encourage other grocers to follow suit.